Once again I/we are woefully behind on posting, so as a quick update before sharing the past few weeks . . . we have been back in NJ at our new home base seeing family and friends. We also participated in the ALS walk in Ocean City – an annual event which brings friends and family together from all over. It was a great event and one that is SO important to Frank each year. It also serves as somewhat of a family reunion for Frank – and all three of his children were in town this year which made him (and me) very happy. We are now back in the Chesapeake Bay for a while enjoying our former home turf . . . but before we got to all of that, we still had to make it back from Rhode Island through New York to New Jersey. We left off with our stormy stay in Point Judith. From there we headed south towards NJ. 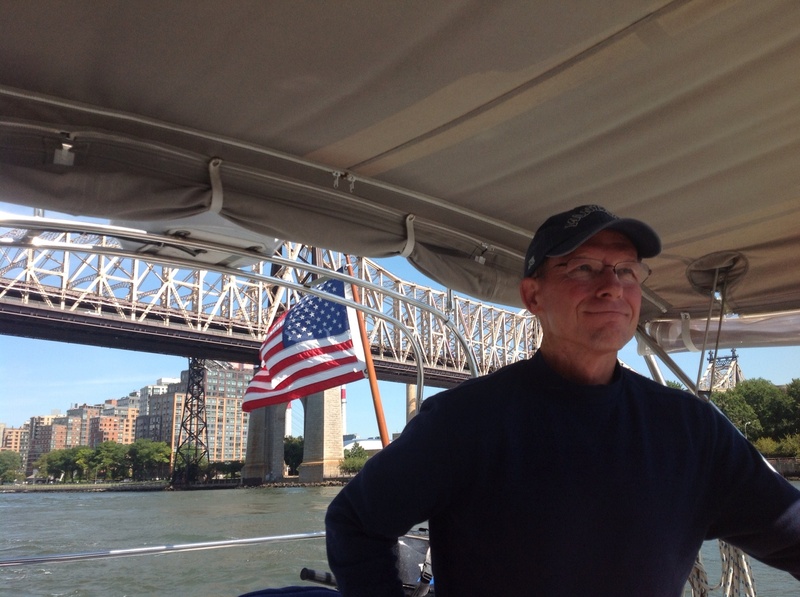 As people ask us what some of our favorite “moments” have been in the last three months, one of the highlights is certainly this last leg that took us down the Long Island Sound into the East River and through New York City. 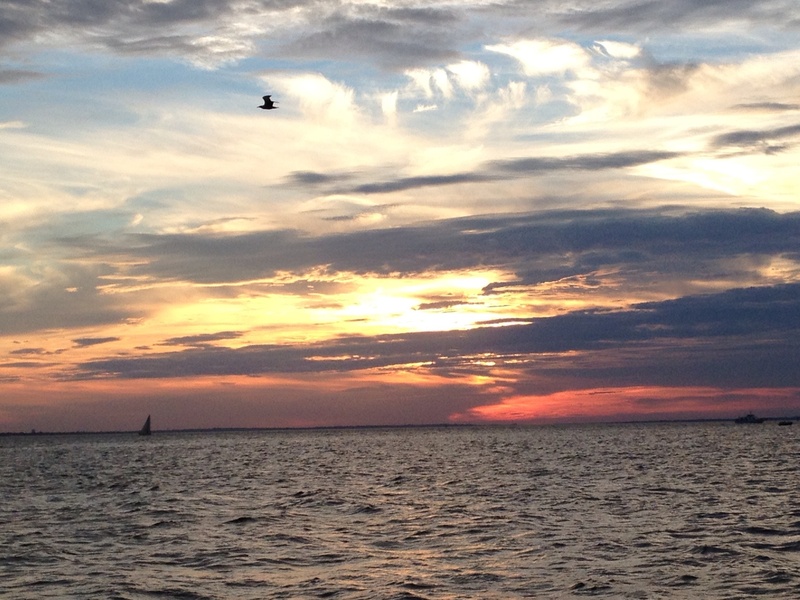 But before we got to THAT moment, we’ll share the very cool re-visit to one of our favorite stops: Shelter Island, NY. After leaving Point Judith, we took a long day to get back to Derring Harbor in Shelter Island, one of our favorite (and unexpected) stops in July on our way up the coast. We visited with our “Gozzard cousins,” once again being treated to their hospitality and graciousness. 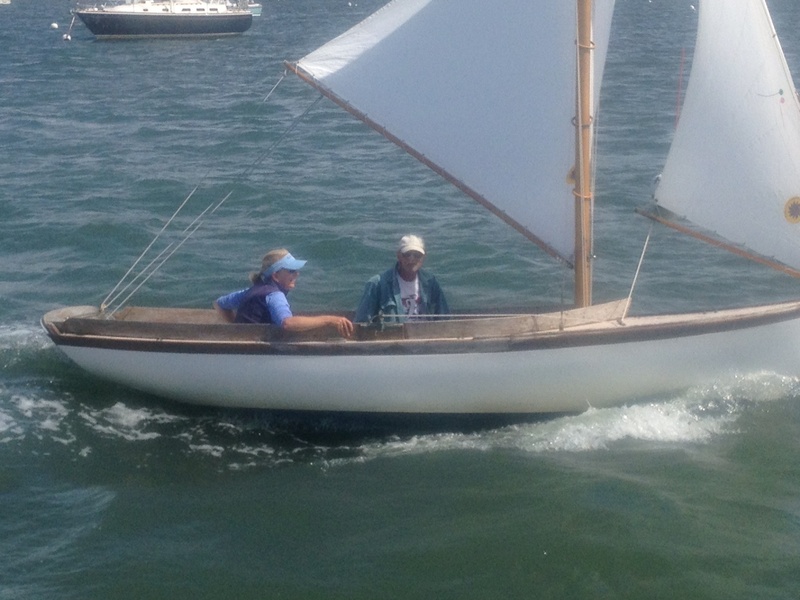 This time around, our friends conspired ahead of time to get me (Ems) out sailing on their Herreshoff doughdish sailboat. Frank keeps telling me that I need to get on a small sailboat to really feel the wind and understand it at a different level than I can sailing on a larger, more forgiving vessel! Our friends agreed and so had decided to get me out for just such an experience. 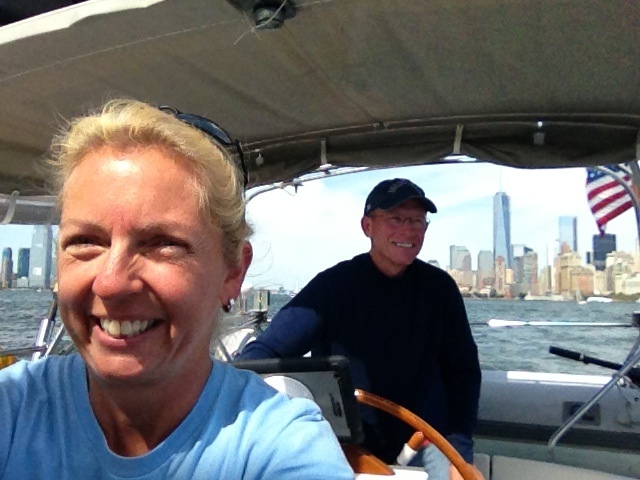 And so, Frank stayed behind and worked on boat projects and my Herreshoff Captain took me out for a lesson! Ems’ sailing lesson! What’s a tiller? After enjoying another meal and musical jam session at their house, it was time for us to push on towards our home turf via the Long Island Sound. After an early start and a rough/choppy first hour of wind vs. current (not a good combination), we made it around the corner through Plum Gut (a notoriously tricky cut between pieces of land that has strong currents, traffic and shoaling) before heading down the Long Island Sound with beautiful conditions – perfect wind and lobster pot free!! 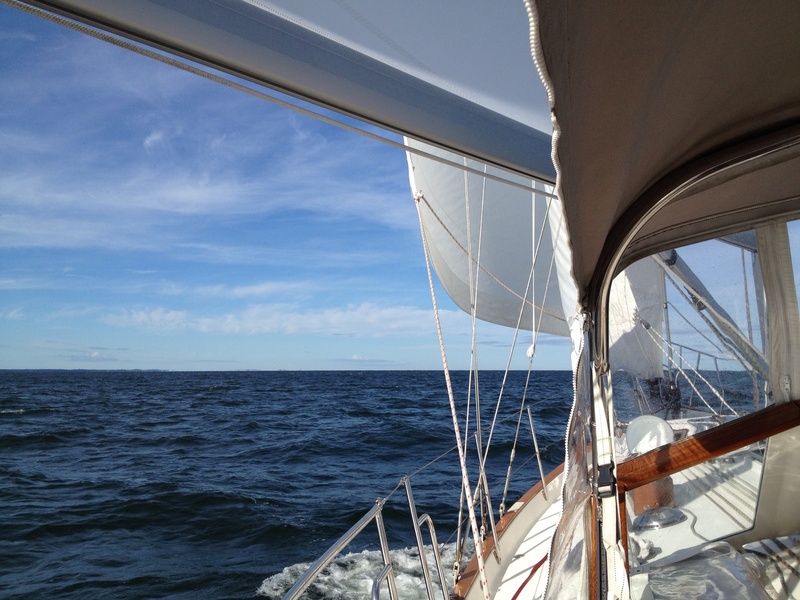 We enjoyed the best sail we had had in weeks! Our destination that day was Port Jefferson. We found a great place in the anchorage there and enjoyed a restful evening. 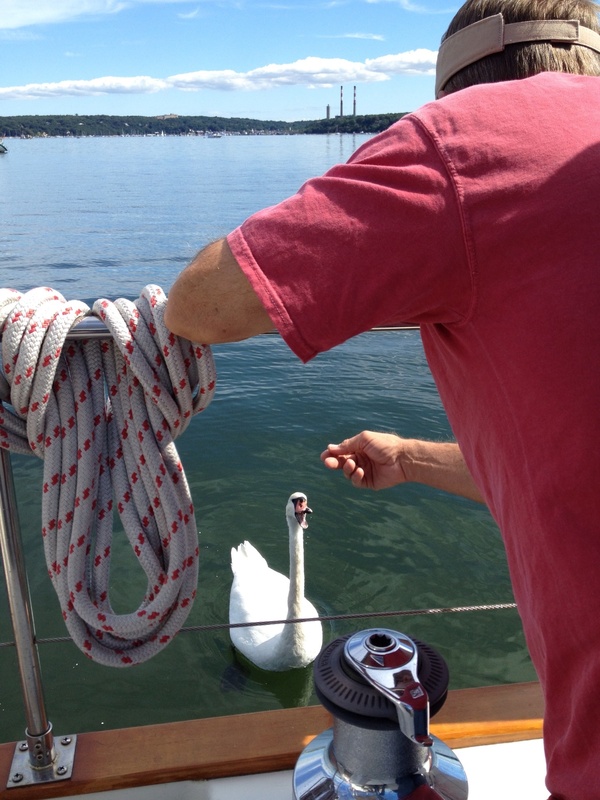 Our welcoming committee was a male swan that Frank promptly named “Bubba.” (By the way – Frank names most any animal “Bubba” if he doesn’t know their actual name.) I will do a whole separate post about Bubba and his antics, but the short story is that Frank had Bubba eating out his hand in short order. After a restful night, we had another early morning departure . . . and saw the remnants of an event that had taken place after we had come into the harbor the prior evening. You never want this to be your boat . . . but it happens. So off we went down Long Island Sound headed to New York City. Now you have to understand – I had some trepidation about taking this route at all. So true confessions here: New York just makes me uncomfortable. I love the idea of New York. I love what it represents for us as a country. But New York and I have a rocky history. 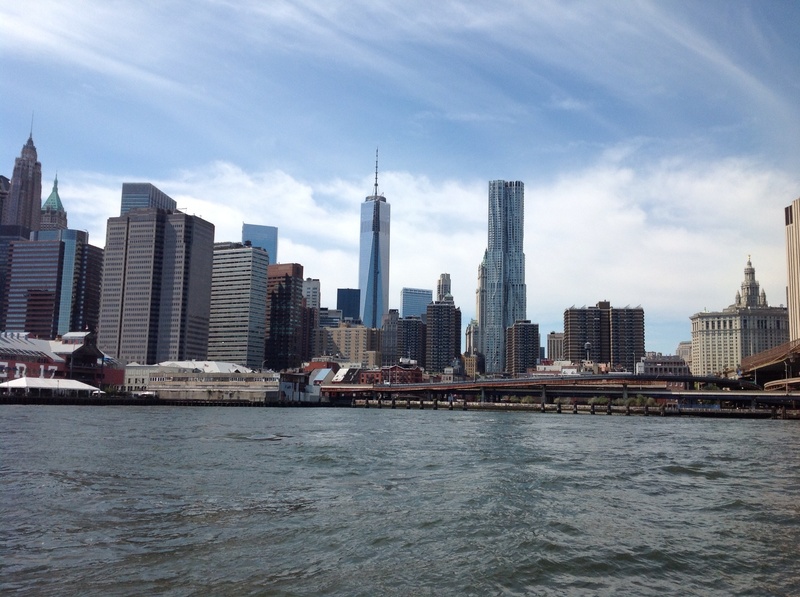 I have been in the Big Apple on a number of occasions over the years. I even interviewed for an HR job at one of the big, fancy hotels back in the mid 90s when my first marriage was going south. I have dealt with a taxi scam, a near robbery in Central Park and a chalk outline on the sidewalk beside my car in the morning after visiting a friend (you know, the kind where the body was laying a couple of hours earlier.) Frank had entertained a number of customers back in his Atlantic City days and always enjoyed his trips to the city pretty episode-free. My “episodes” in the city all happened when I was in my 20s and 30s, so I figured I was past all of that when I accepted a consulting gig there in 2001 in the World Trade Center. I worked on the 54th floor of Tower 2 about 8 days a month for about a 9 month period. The last day of my contract was July 6nd, 2001. You do the math . . . I harbor a lot of mixed feelings about the place. So when I thought about the idea of sailing right through the heart of it all, I wasn’t sure how I felt about it. Frank had even coached me to have an attitude adjustment about the trip. I almost wanted to bag it and go back out in the Atlantic and do another long passage to get home. But after much discussion, we decided that New York was the way to go – and I managed to embrace the idea and get into the spirit of the trip. What we did not expect was the overwhelming feeling of excitement and pride that we felt as we cruised through the city on a spectacularly clear and sunny day. All the corny lines that you hear in songs about New York kept coming to mind during the trip . . . the city that never sleeps being the one that I kept hearing the most. The place was just throbbing with energy and activity in every direction! Ferries, mega yachts, skyscrapers, airplanes, helicopters, water taxis, sky writing planes . . . it was 90 minutes of constant action . . . it was truly sensory overload!! And from a navgtional standpoint, there’s an awful lot going on! 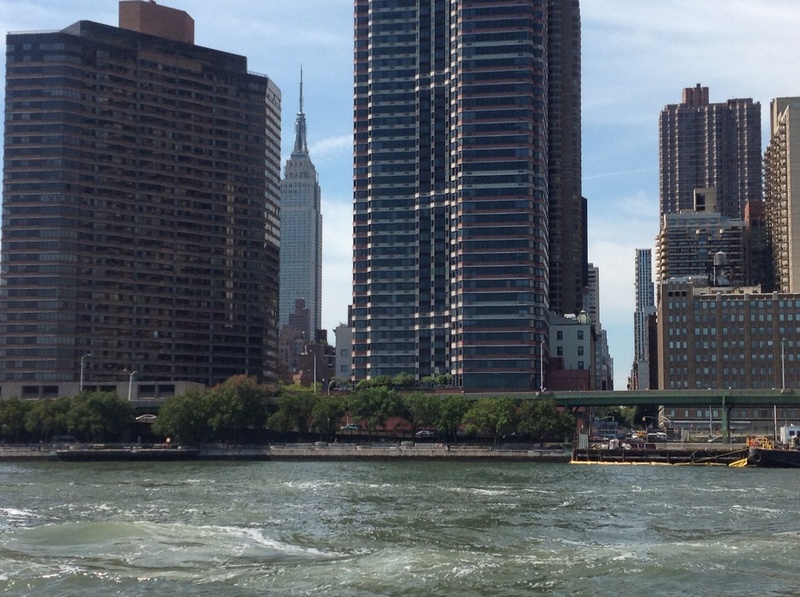 There’s mega boat traffic and currents to contend with and two rivers coming together to create eddies at “Hell Gate.” There isn’t much more to say about it than that: let’s just let the pictures do the talking! 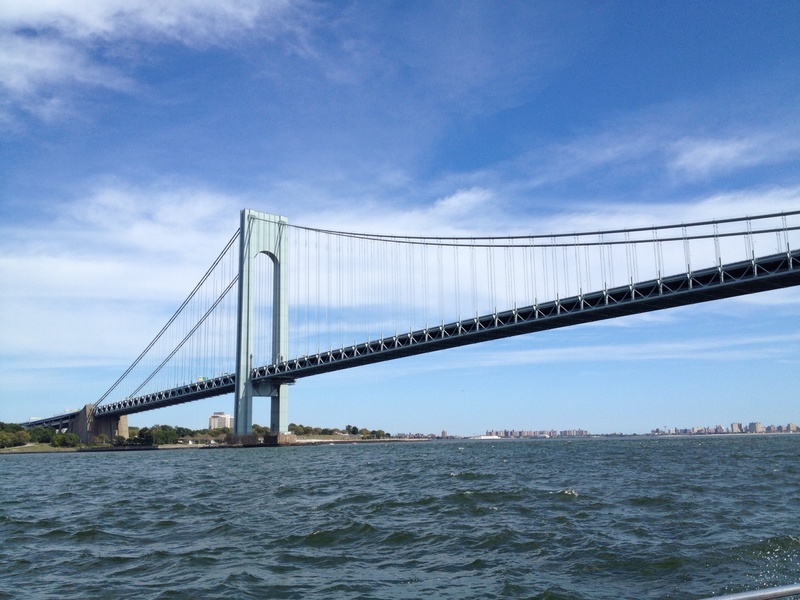 Throgs Neck Bridge, one of many bridges we passed under. 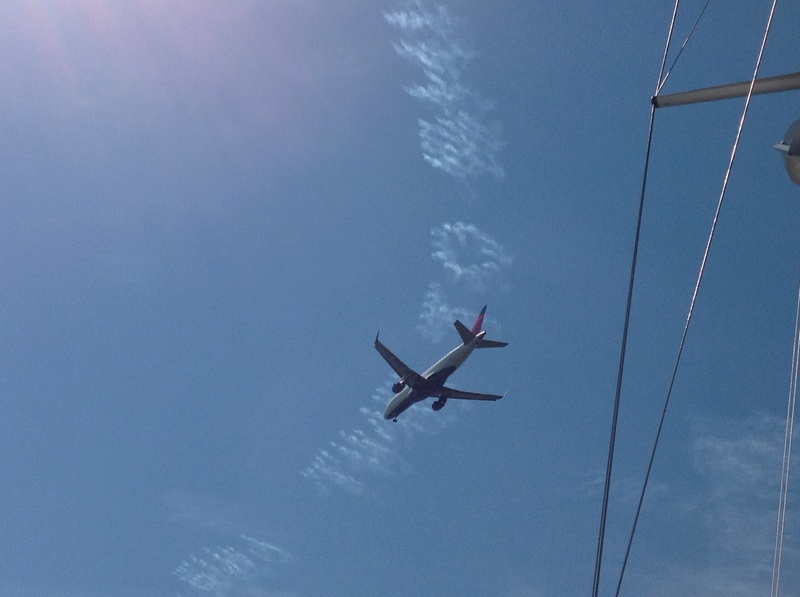 I was taking a picture of the plane flying over when I realized there was a skywriter publicizing a new restaurant! When was the last time you saw a sky writer?? We were watching planes landing at LaGuardia right next to the tennis center where the US Open was being played at that moment which is all right next to Rikers Island! Look closely – there’s a tram going across the top of the bridge! Really?? The captain is trying to navigate and take it all in! 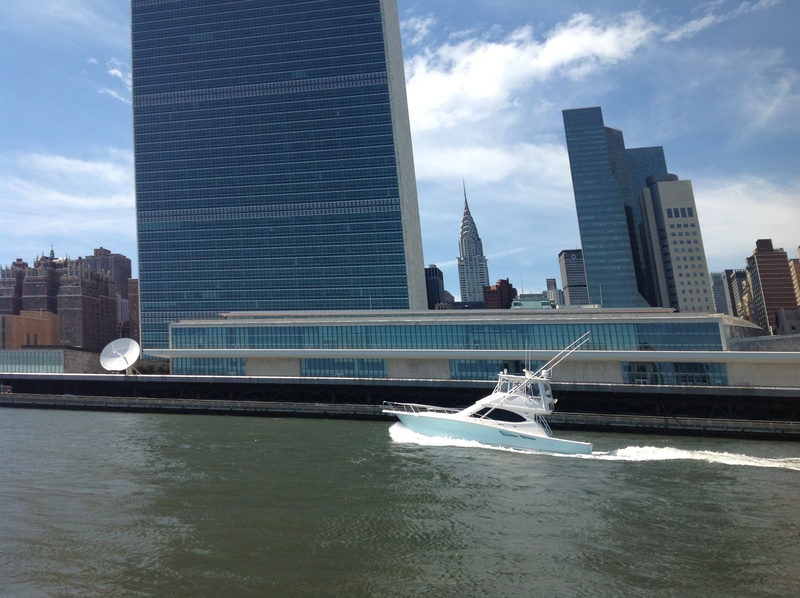 The United Nations Building with the Chrysler building peeking out from behind. The Empire State Building appears! A look at the new 1 World Trade Center nearly completed. 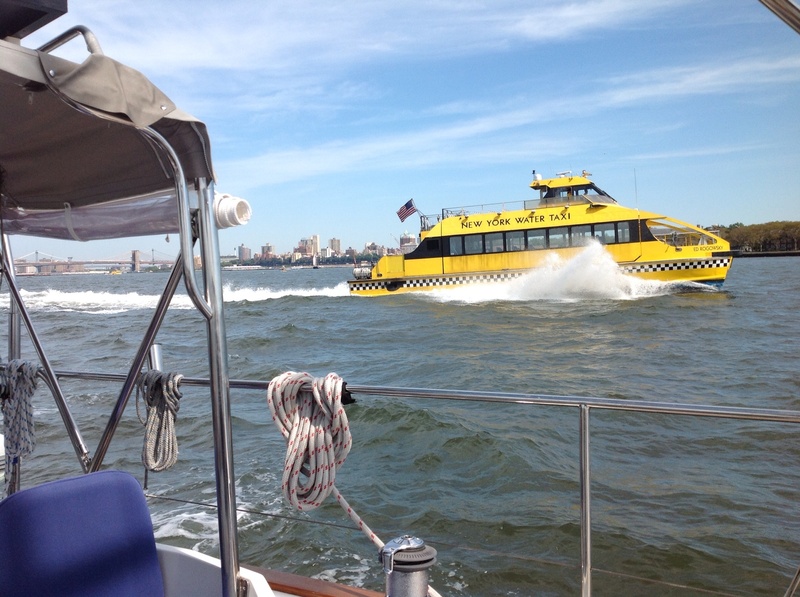 The water taxi is a popular mode of transportation. We made this trip on a Saturday which meant that, as busy as it was, it would have been far more hectic on a week day! 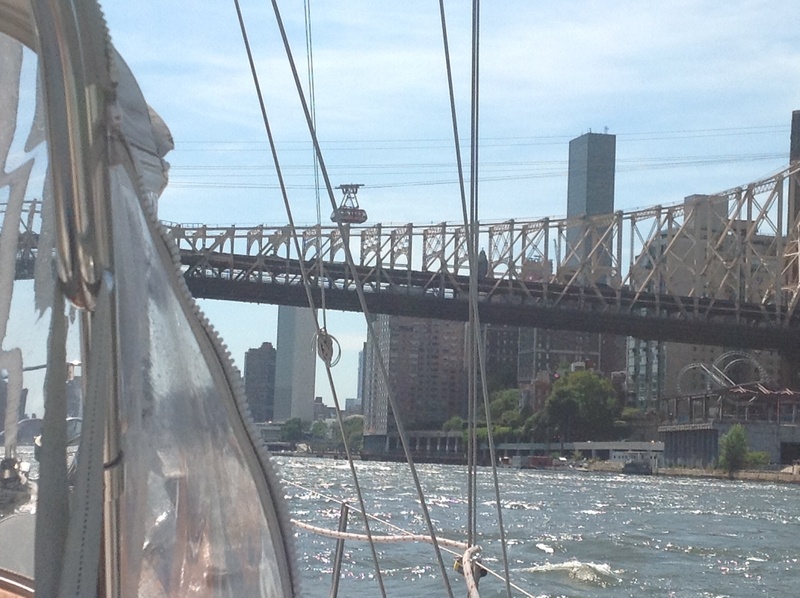 And then we cruised right by the Statue of Liberty. And a final look over our shoulders at the skyline! Whew!We then cruised past Coney Island, one of the options for anchoring for the night, but decided to push on to Sandy Hook, NJ. I don’t often use the word “awesome,” but this was truly an AWESOME day in the truest sense of the word and we were awestruck. A lighthouse on the way to Sandy Hook . . . Frank finally got to take a breather and let Ems take the wheel for a bit. 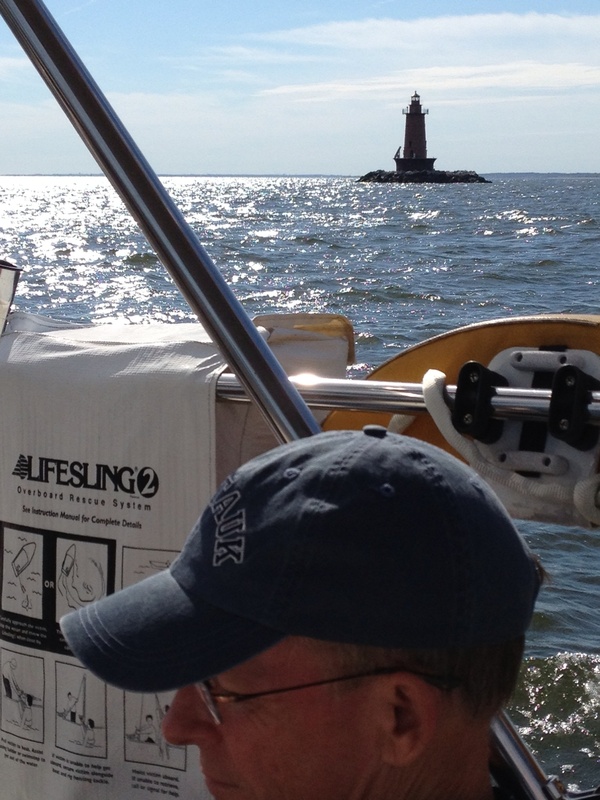 We anchored in Sandy Hook, totally spent from our overwhelming day! We settled in at anchor in Sandy Hook. 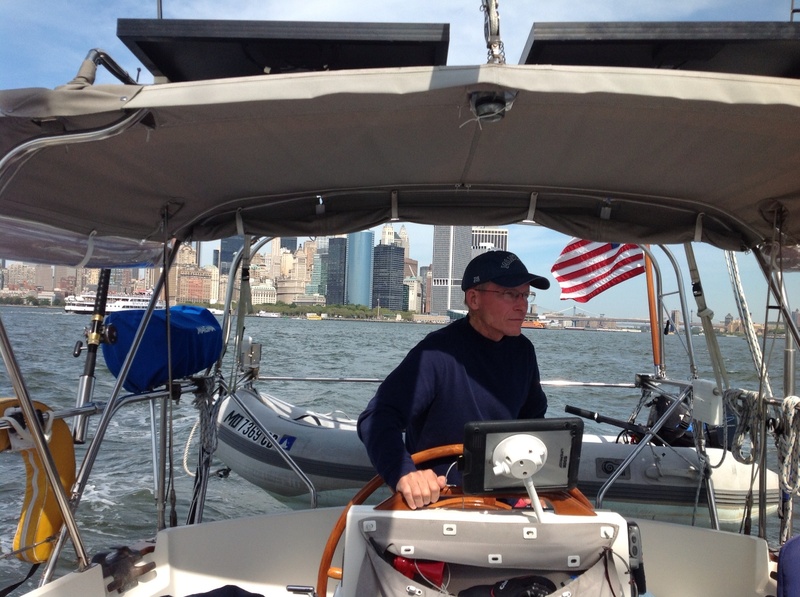 The next day was going to be a long passage, and again, our timing was based on wind forecasts and the time of day we wanted to arrive in Little Egg Harbor Inlet in Longport, NJ – our base of operations when we’re at “home base” in NJ. We we had the next day to relax and rest before leaving at 4pm for our 16 hour trip down the coast. And while we were enjoying time in the cockpit, look who came around the corner! 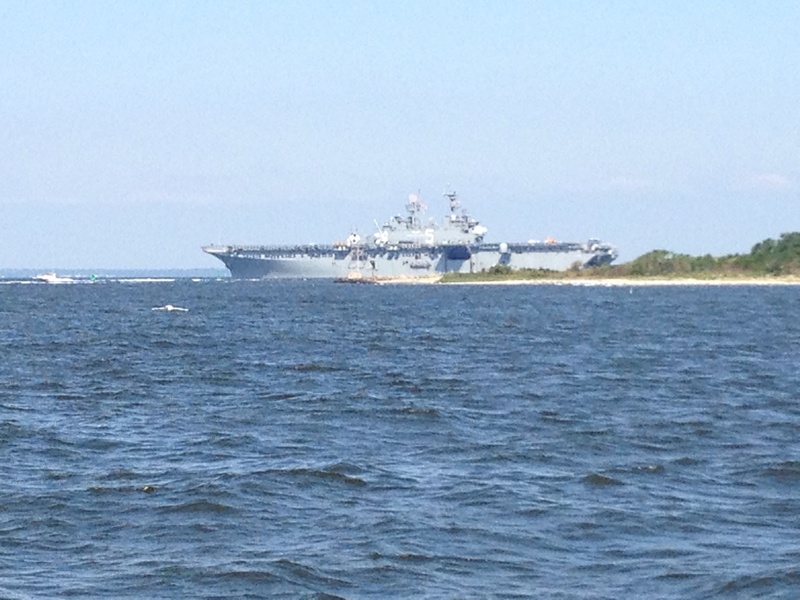 Why, just a lil’ old aircraft carrier, that’s who!! It was carrier #5. We were able to look it up and see that it is one of the “small” carriers that is especially for harriers and helicopters. This ship was also one of the first to respond after Katrina as it can be used as a mobile hospital unit as well. Look who’s coming around the corner!! Around 4:00 in the afternoon, we departed for our overnight trip down the coast. Now my second time down the coast overnight, I knew a little more what to expect. As with the first time, there were exceptionally inspiring moments and exceptionally nerve wracking ones as well. 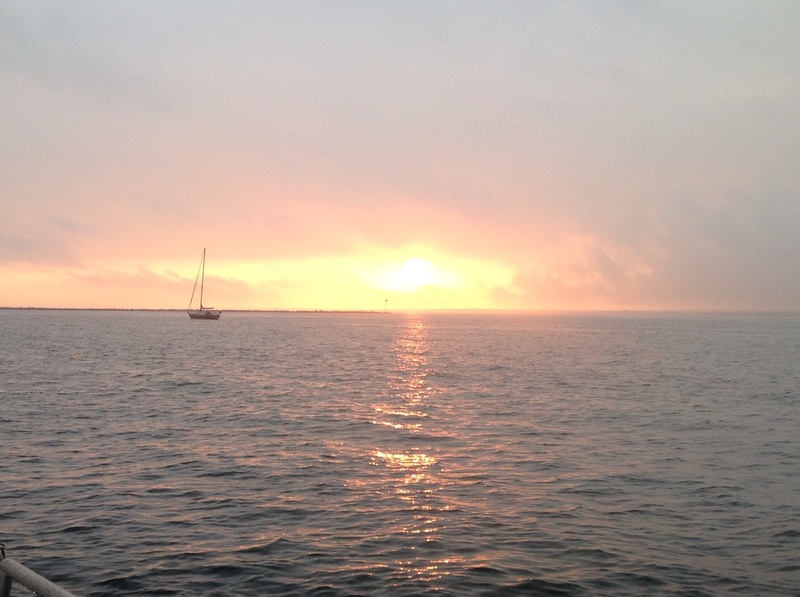 Sunrise and sunset are always amazing on the water – those are the great moments. The number of stars you see (since the moon set very early that night) is beyond words. We took approximately 2 hour watches early on which then spread to 3 hour watches overnight. As with the last time, the first hour of real dark threw me (Ems) for a complete loop. What a feeling of disorientation! But after that adjustment is made, it is kind of magical (although I’ll still opt for daylight when given a choice.) 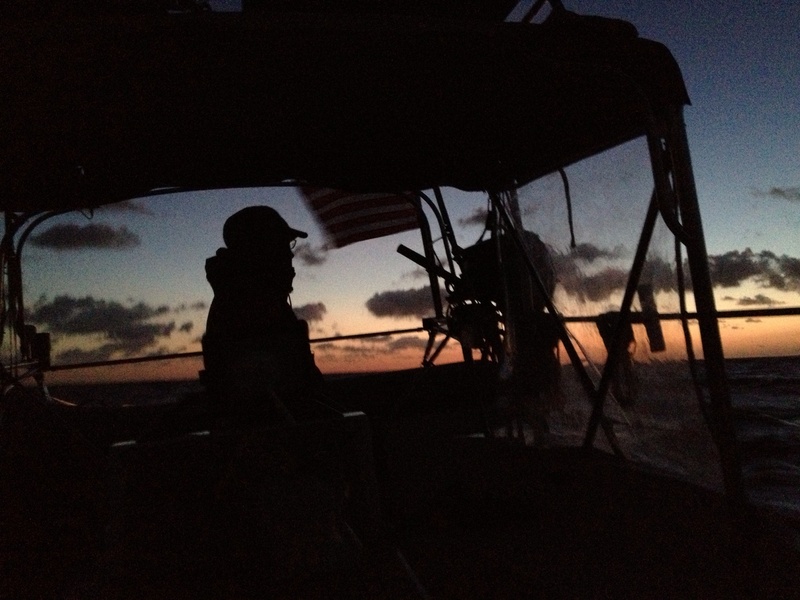 The forecast had called for winds to pick up after dark, but we had let the reef out of our sail early on since the strong winds were not there yet. Quick review: reefing your sails means you don’t have the full sail unfurled so you don’t get overpowered with heavy wind. There is an expression that if you’re wondering if you should reef your sail, you’ve already waited too long. We proved that again. 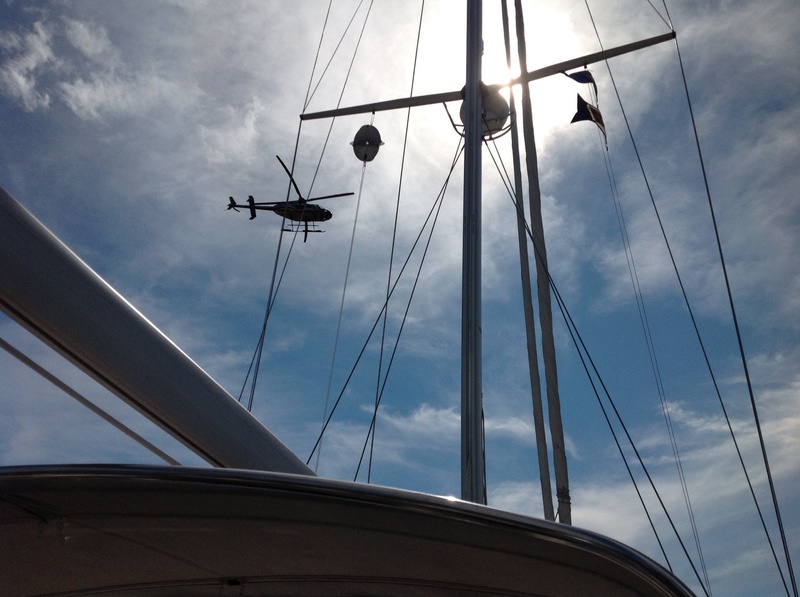 Let me say that this was never dangerous – just unnerving for the inexperienced crew member! 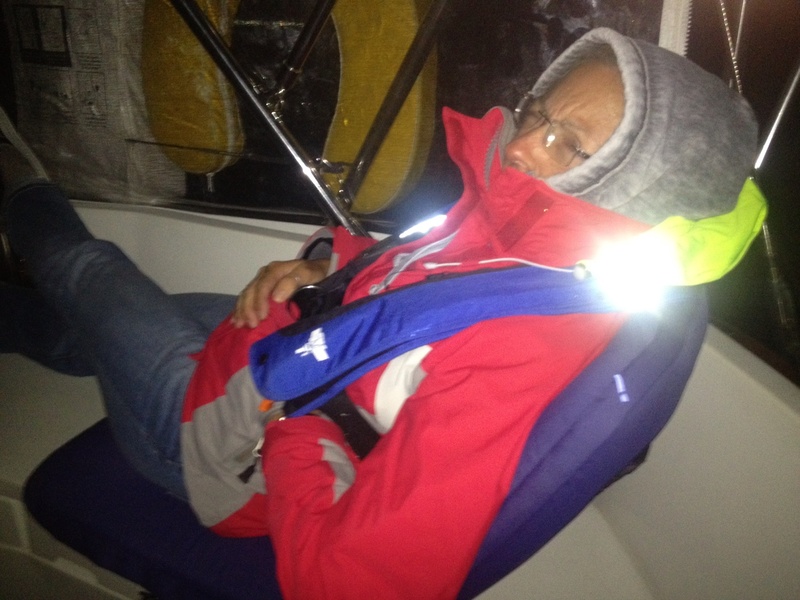 I was at the helm and Frank was still in the cockpit with me but attempting to get a nap. The wind had been building and I had been hanging in there with the growing wind, the growing seas and our increasing speed. (It WAS nice to be making our destination more quickly!) And then the wind was just a little too much and I experienced the phenomenon of losing the ability to steer the boat. We were heeling like crazy and I couldn’t fall off! (turn away from the wind.) I know when I need help and I yelped a clear, loud yelp which got Frank to leap up out of his light slumber to see what I needed. The sailors reading this are now going, “Well duh, Mary Marie! Just head it up into the wind if you have to to depower the boat!” Yeah – I know that now, thank you! It just makes such an awful racquet when you do that and it just feels wrong. But I get it . . . lesson learned. Frank quickly did just that – enough to get us back under control . . . and then I headed the boat directly into the wind while he reefed the sails. After that, the ride was a lot less harrowing and a lot more comfortable. That got my heart beating! But all of those moments are good learning and provide me with more experience. I’m just going to keep repeating that to myself several more times until I actually believe it. Here are some of the beautiful moments of dusk and dawn. 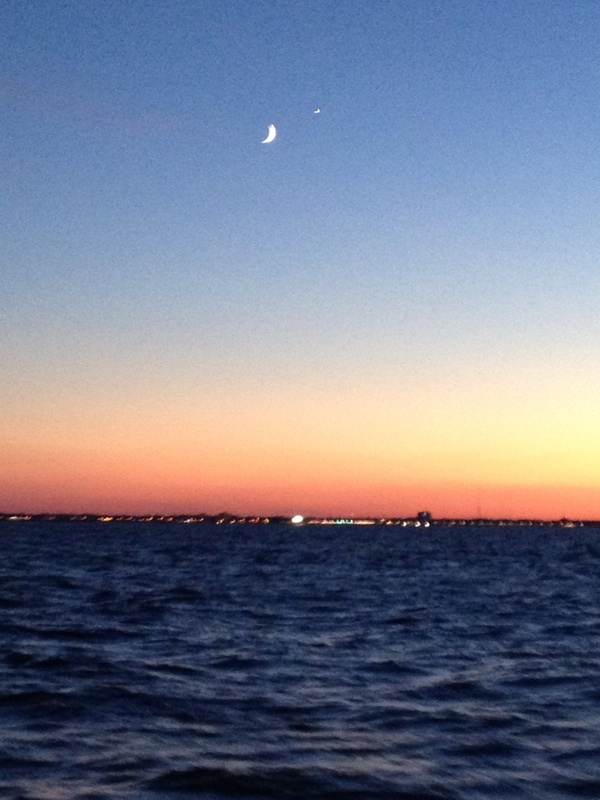 A new moon at sunset over the Jersey Coast. Frank looking at the first light of dawn over the ocean. 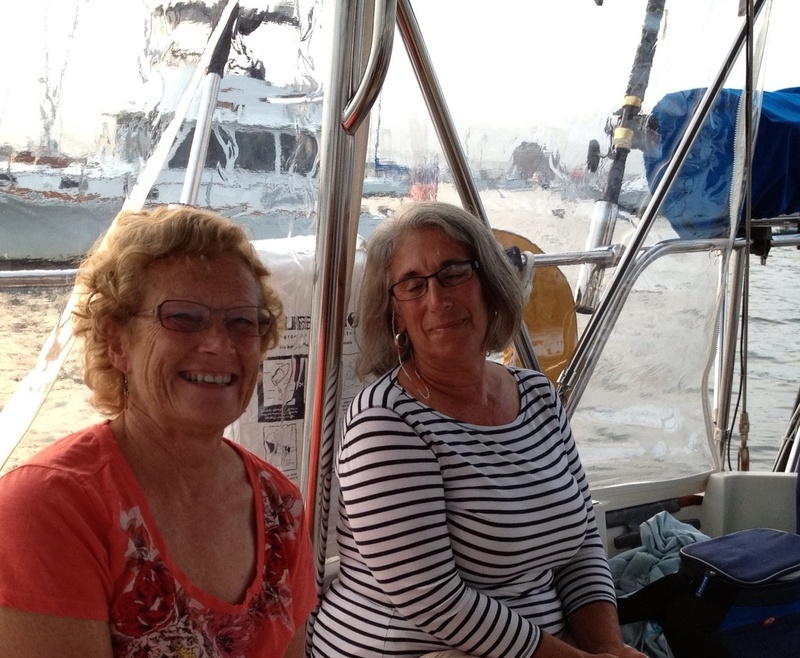 We sailed all night and cruised past Atlantic City in the early morning, arriving in Longport and back to Seaview Harbor Marina around 10am where we would park Eleanor Q for the next two weeks. And so the first “segment” of our adventure comes to an end. We made it to Maine and back – over 1,000 miles! We have spent time reflecting on our major learnings in our first three months and here are some of our key takeaways: a) you don’t have as much time as you think you do to see and do everything you thought you would, b) it is HARD WORK between boat maintenance, dealing with weather issues and just the physical demands of operating the boat, and c) there’s nowhere else we’d rather be right now. It is every bit as cool and stimulating and challenging and fun as we thought it would be. After a few weeks back in the Chesapeake, we’ll spend the next few months on “segment 2” – going down the southeast coast of the U.S. before our leap to the Bahamas this winter. We’ll keep you posted!! Thanks for riding along with us. 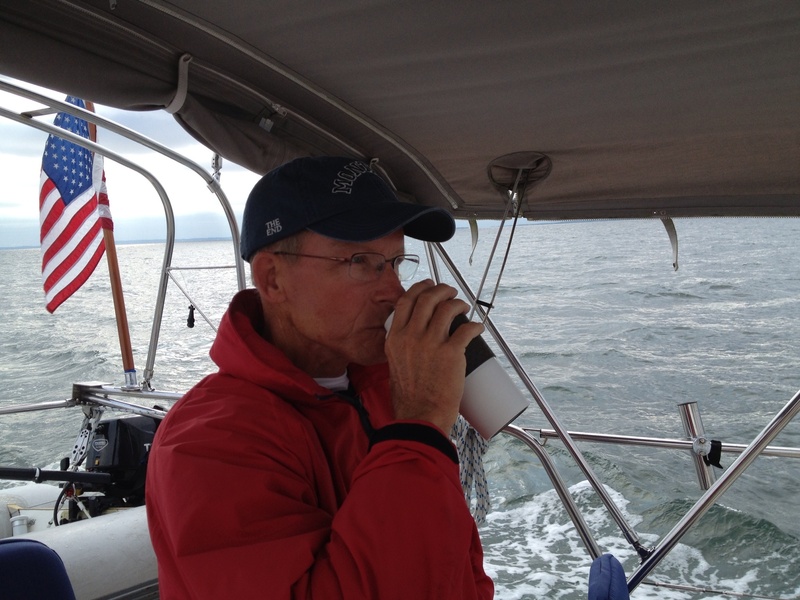 After passing through the Cape Cod Canal and anchoring in the harbor at Onset, Mass., we were off to an early start to make our trip to Newport. 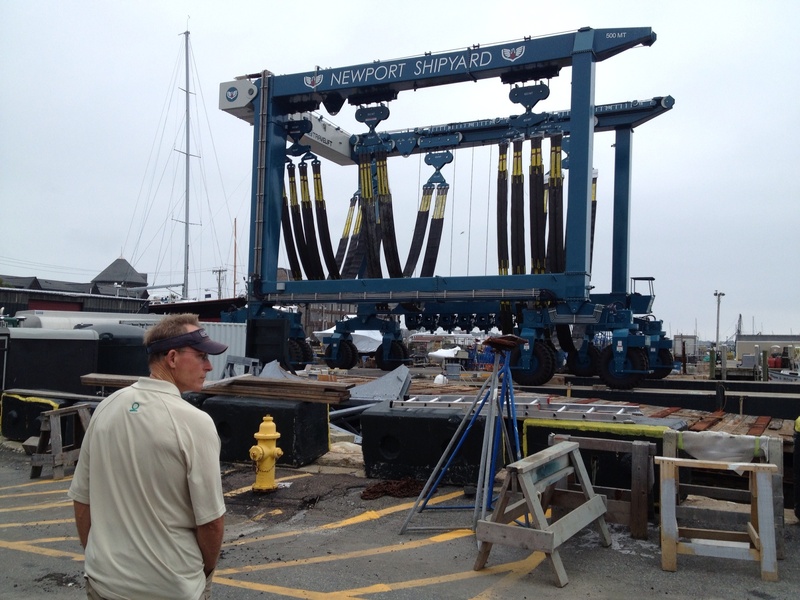 There is some back and forth about which is the bigger sailing/boating center: Newport or Annapolis. At great risk, that will be commented on later. 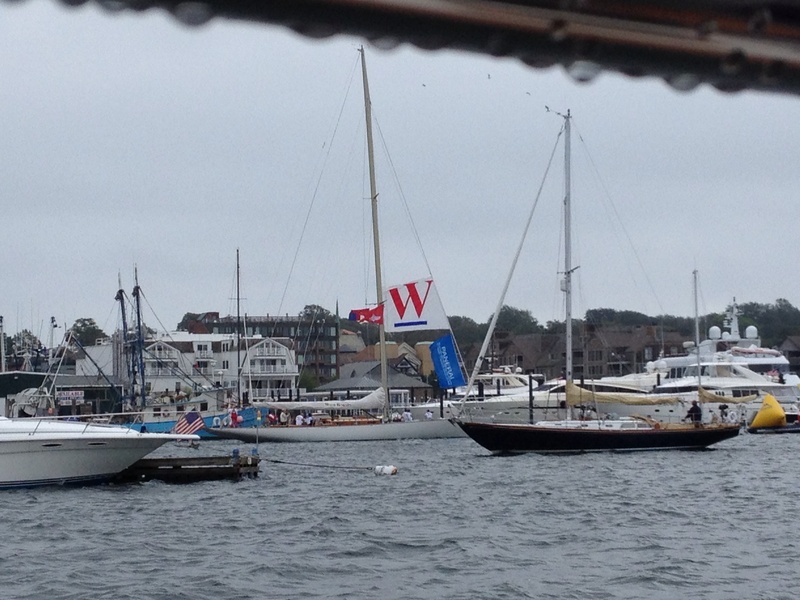 We arrived in Newport right at the start of the Labor Day Weekend. We generally try to avoid the popular places on holidays, but we needed to get moving towards NJ and the wind forecast was the major driver in our choice of destination, plus we really wanted to see Newport! So holiday or not, we decided to go for it. It was a fun weekend with lots of boat “eye candy” to observe. It also turned into quite a social weekend with other cruisers. First of all, Newport Harbor is HUGE! And even before getting completely into the harbor, we started to get a flavor of Newport from the boats in the area and the mansions on the shore. 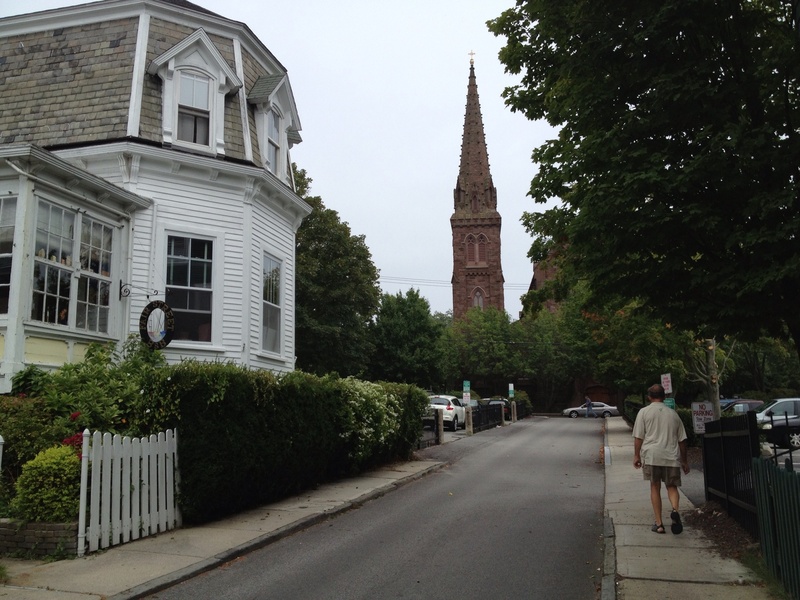 Newport was a big hangout for the Vanderbilts and other families of that ilk and there are a number of historic mansions that are open for public tours. Although we did not do any of the tours, we did pass them as we came in to the harbor. A gorgeous 12 meter sailing vessel . 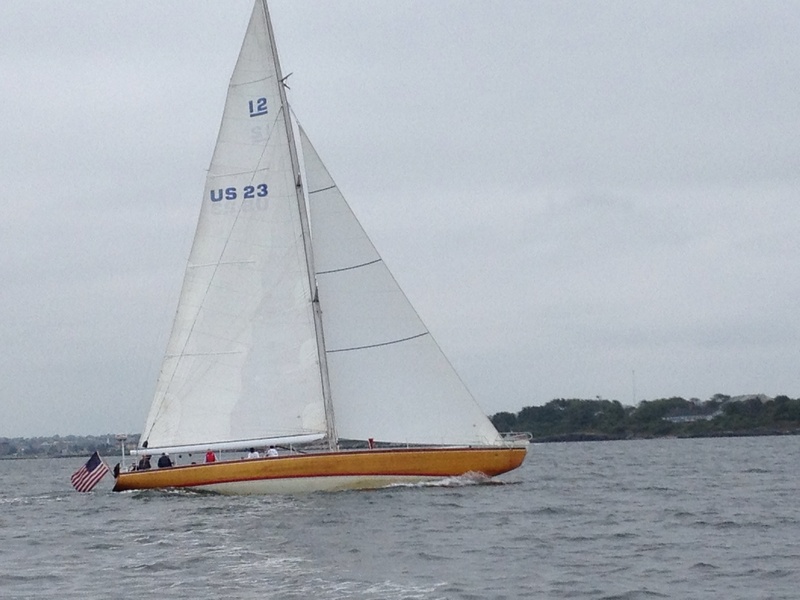 . . the classic that was raced in the America’s Cup in the past. A fine example of the mansions of Newport. Another major landmark at the entrance to the harbor is Fort Adams. 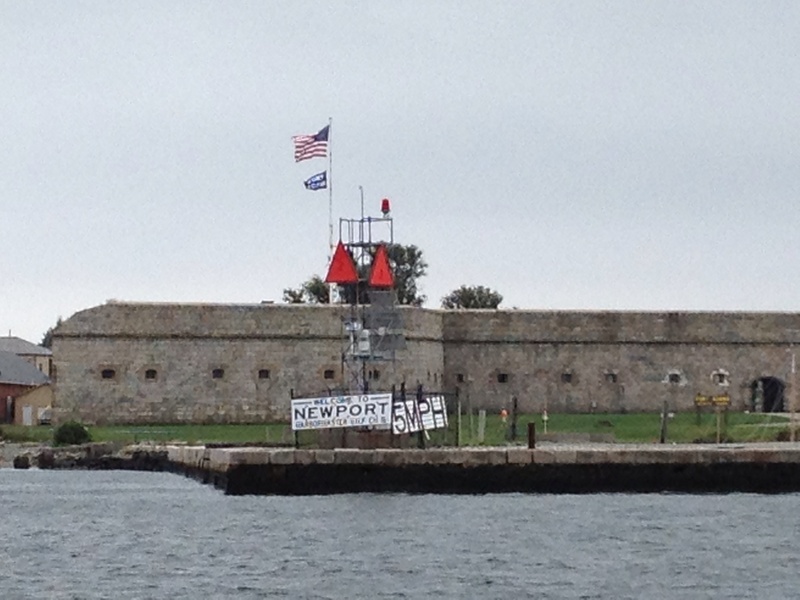 The fort is now a state park that hosts the famous Newport Jazz Festival among many other major festivals. But the fort has an interesting history. The first version was built in 1799 and was used during the War of 1812. After that war, it was decided that a newer and larger fort was needed and the “new and improved” Fort Adams was built (completed) in 1857. The fort served in five major wars: Mexican-American, the Civil War, Spanish-American, WWI and WWII – but it never fired an angry shot. I found it particularly interesting (because of our affiliation to Annapolis) that, during the Civil War, the War Department was concerned about the political sympathies of Marylanders, so the Naval Academy was relocated to Fort Adams from Annapolis for a period of time until after the war. In 1976 the fort was declared a National Historic Landmark and in 2012 the park was the official venue for the America’s Cup World Series. We passed the fort a number of times. But I’ll get to that in a minute. We spent a good part of the weekend just walking all over town and seeing the sights. Here are a few of our stops along the way . 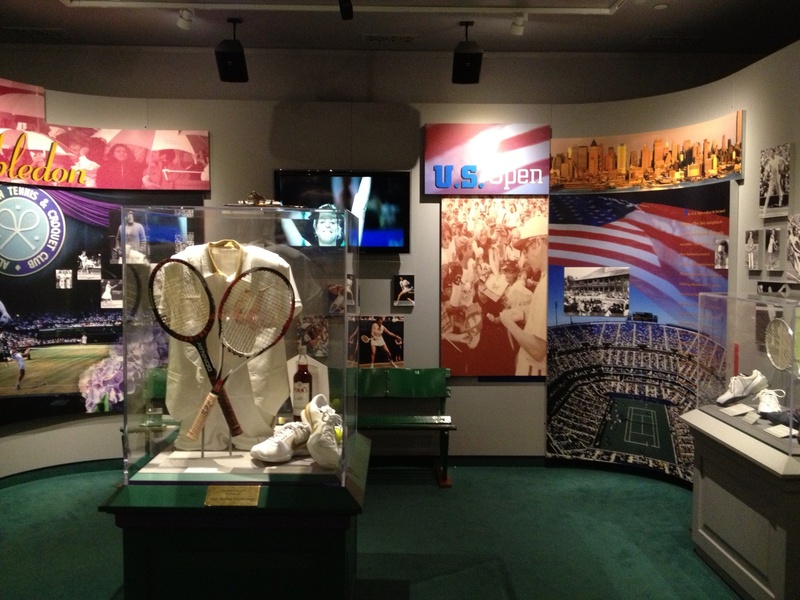 . .
One of the displays at the Tennis Hall of Fame. By the way – Chris Evert has little teeny feet! We didn’t see her feet; just her shoes. We made a visit to the International Yacht Restoration School (IYRS). 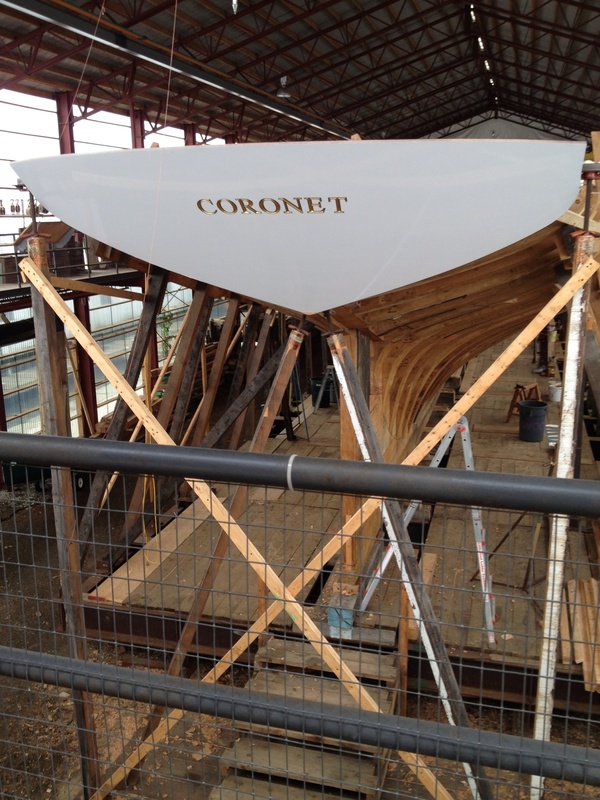 There are all types of old wooden boats throughout the facility that are being worked on, but the MAJOR project housed at the school is the restoration of the old wooden sailing schooner Coronet. The Coronet was originally built in 1885. At 131 feet, it is one of the oldest and largest schooner yachts in the world. She had an auspicious career as a transatlantic racer and global cruiser. In 1905, a religious organization called “The Kingdom” purchased the ship for $10,000 and took it around the world on prayer missions. The Kingdom owned the boat until 1995 when the IYRS acquired her and began a complete restoration of the vessel. Walking around the “bones” and looking at every article that was taken out of the boat, carefully cataloged and hung nearby is breathtaking. I can’t even imagine how many years this project will take, but we’ll be interested to see the final product when it’s finished! Here is the giant fishbone that is the Coronet right now. We continued our walk around town hitting one or two shops. 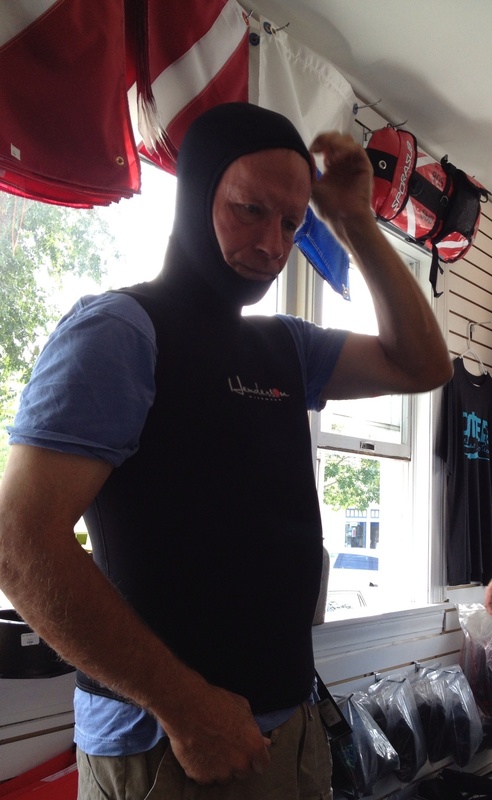 Frank was on a mission to get a better wet suit option for colder temperatures (following our trip to Maine!). Here he is trying on a hooded wetsuit vest . . . I felt compelled to snap a shot. I know . . . nice of me. The Irish Spiderman . . .
Then we walked around the docks and boat yards. Oh my goodness . . . the boats, the size of the boats, the size of the boat lifts! Compare boat size to me and the Smart Car parked beside it. That’s a whole lotta boat! 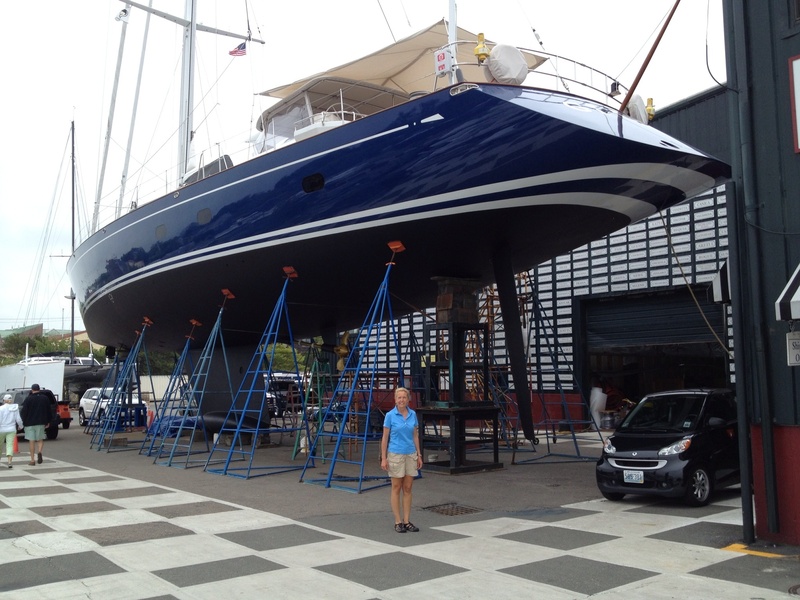 And when you have to get a really big boat out of the water, you need a really big lift! One example of the eye candy . 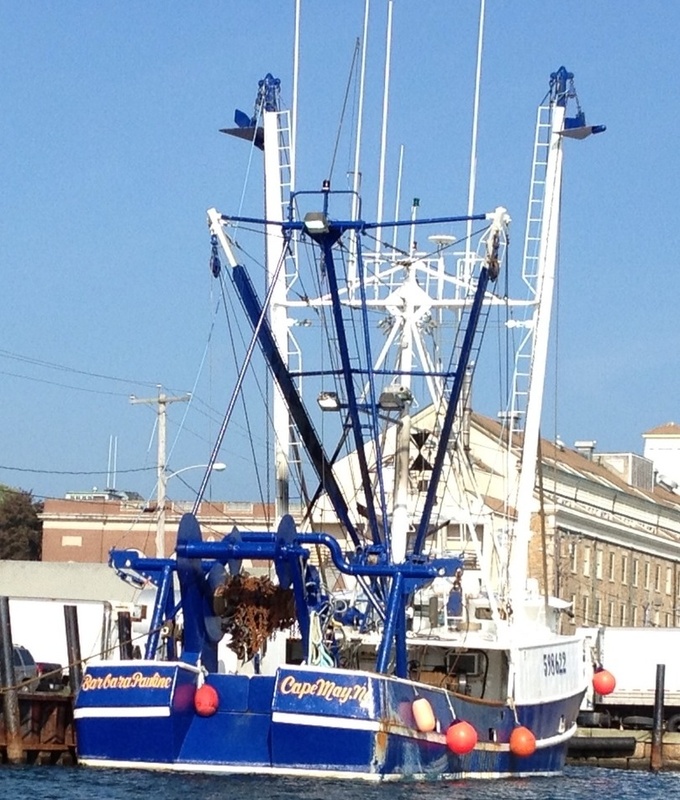 . .
And then as we were driving the dinghy around the docks, Frank spotted this vessel that he recognized – a fishing boat from Cape May!! Frank worked for a Captain whose son owns this boat. We never could find anyone on it to talk to. They were parked for the weekend and the crew had gone ashore. Too bad. On Sunday there was a Wooden Boat Regatta. The festivities began with a boat parade around the harbor. We had a front row seat for it in our cockpit! Also on the agenda for Sunday . . . the ever dreaded trip to the laundry. Ugh. But wait! There is a pretty new Mariners Facility in Newport right off of one of the piers . . . it is the lower level of an old church and it has brand new laundry/shower/lounge facilities. It was SPOTLESS. And more amazing than that, it was EMPTY!!!!! 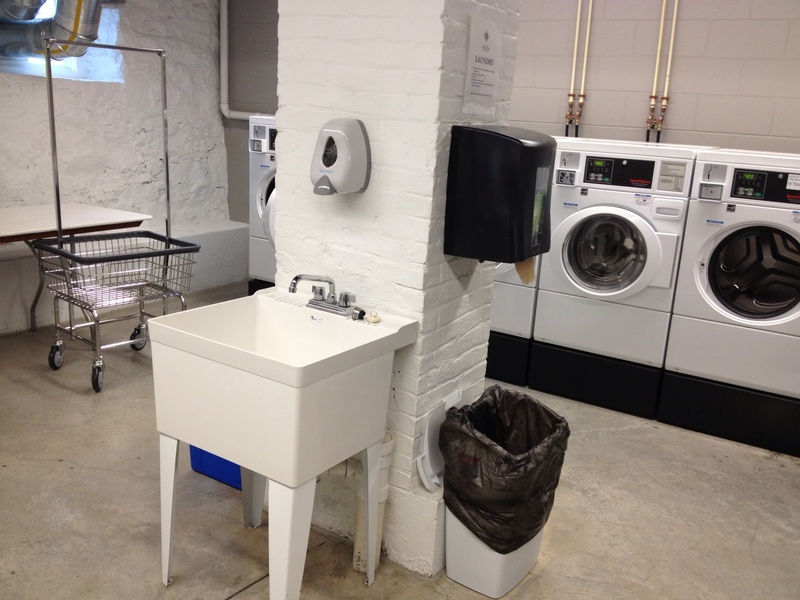 Oh yeah, baby – had the whole laundry to myself! I was so excited, I had to take a picture. Laundry in the Mariners Facility – 5 Stars! In our travels to the pier, we ran into another couple who we had met twice and had drinks with once in Maine!! Also that morning, we heard a dinghy approach the boat and a voice call out, “Ahoy Eleanor Q!” It was a man from a boat that we hear on the “nets” on the radio every morning. He recognized our boat name from the net and thought he’d stop and say hello! Long story short, a cocktail party was born for that evening and our new friends from Exuberant and Kabria joined us and shared snacks, beverages and good company! Great camaraderie in the cruising community! So after a pleasant couple of days in cloudy Newport, we planned our getaway for Monday morning. We arose at one of those hours that I don’t particularly care for and set off for our next port . . . but not so fast. As we pulled out of the harbor and said goodbye to Fort Adams, we noticed light gray smoke mixed in the engine exhaust. That is never a good thing. We slowed down and pondered our next move. Do we keep going? Do we turn around? We let the engine run for a while longer and Frank did some initial trouble shooting. 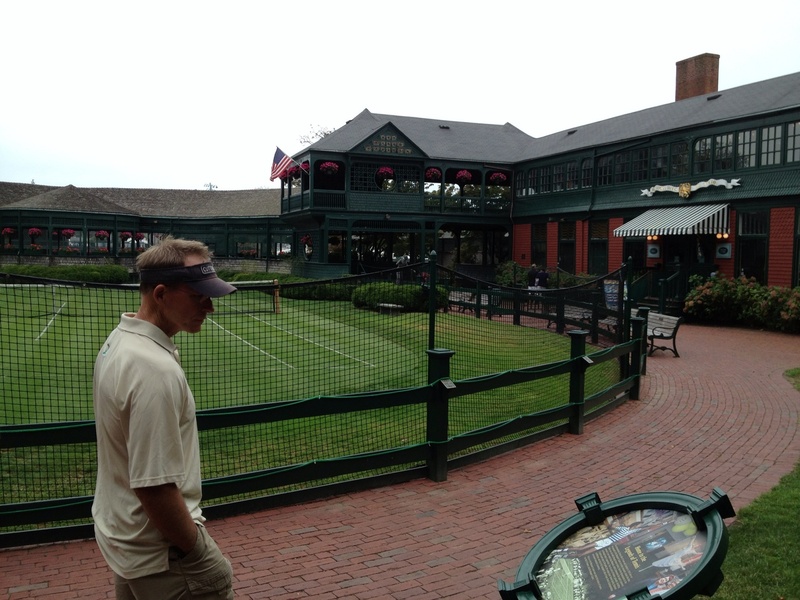 After weighing the options, the smart decision was to return to Newport. 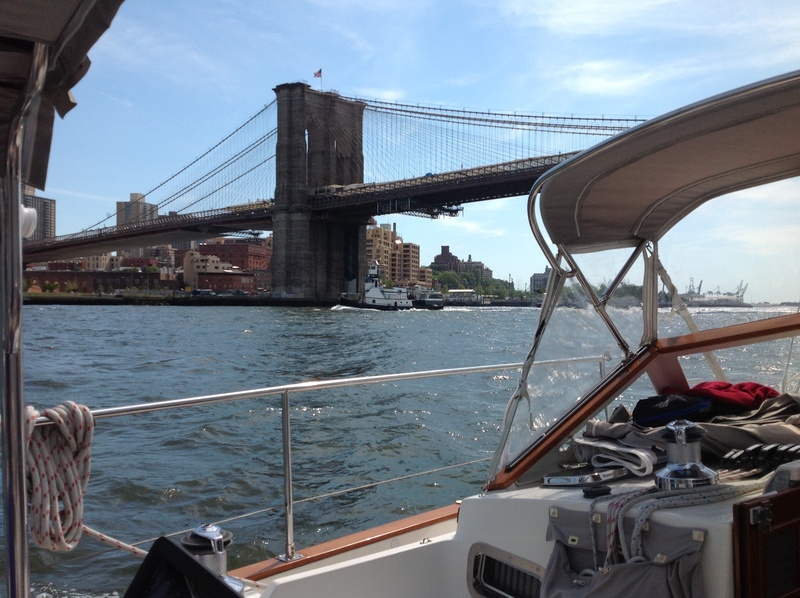 There are few places that have more services for boaters in the world . . . so why would we not figure out the problem there. 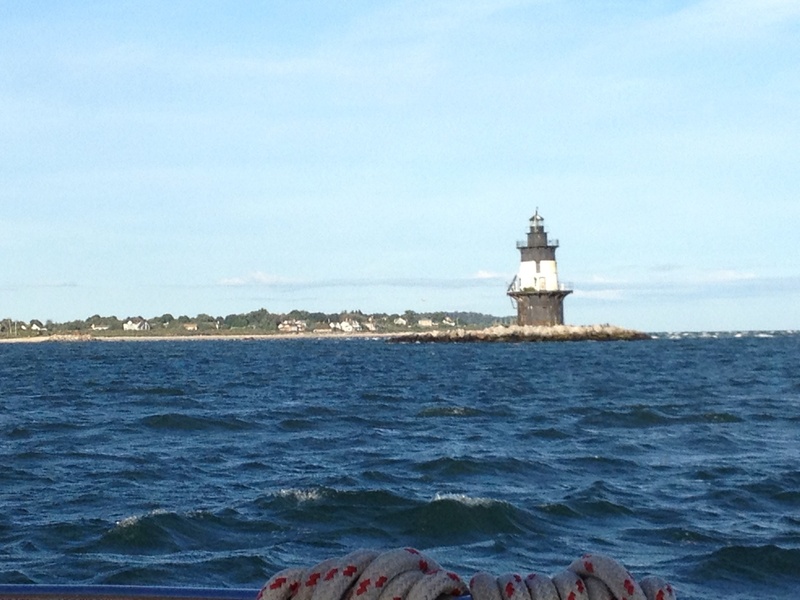 So back we went past Fort Adams (again) and dropped the anchor. I think Fort Adams was smirking. Argh! The captain/chief engineer set to doing some more troubleshooting. We thought we found the problem . . . and thought we had solved it, but by the time that was accomplished, it was too late to catch the favorable current that day. Okay – let’s stay put and enjoy a quiet afternoon on the boat, which we did. The next morning – again at an obscene time of day – we set off again. We passed the very smug Fort Adams, waved goodbye and went on our way . . . for a minute . . . when the smoke reappeared. NOOOOOO!!!! 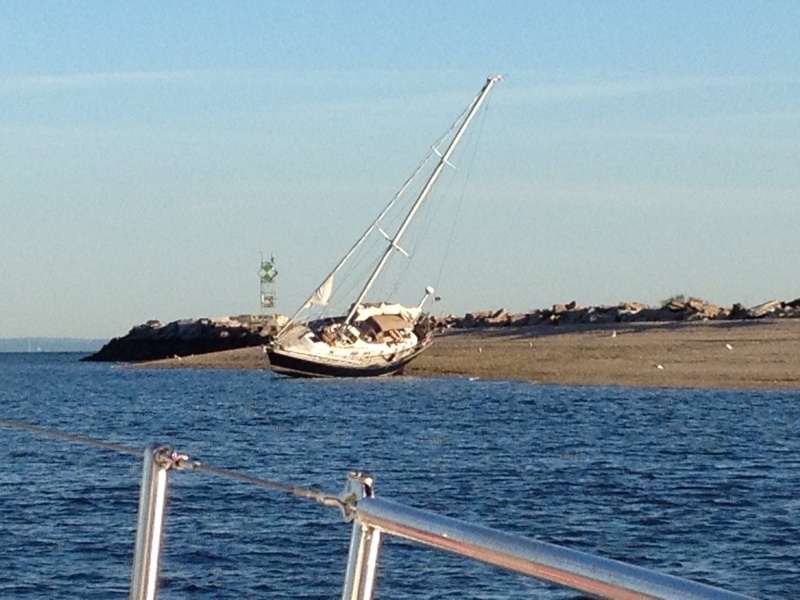 We turned around, flipped the bird at Fort Adams (which I now think was laughing at us), and came back to anchor again. ( Okay, I didn’t really flip it the bird, but I thought about it.) Certain we were going to need a mechanic, we left messages all over the place and waited for the return calls to come. Meanwhile, the trusty captain/chief engineer went at it again. And God bless him, he found the rest of the problem in fairly short order and we were off!! We looked at Fort Adams with mistrust and bid it goodbye a final time. Just for spite, the fog set in right about at that moment. I think the fort had something to do with it. For those who might be saying, “Yeah, but what was the problem??? ?” … let’s just say that the air filter looked like it came out of a coal mine in West Virginia and I could have made a lovely salad with the stuff that came out of the engine strainer. The engine was being deprived of air and water and it was not very pleased about it. We had checked the strainers not long before, but we must have made a wrong turn and driven through a swamp at some point along the way. Anyway, all was well. And for those who want to know, and I hate to say it because we love Annapolis and that has been our home port . 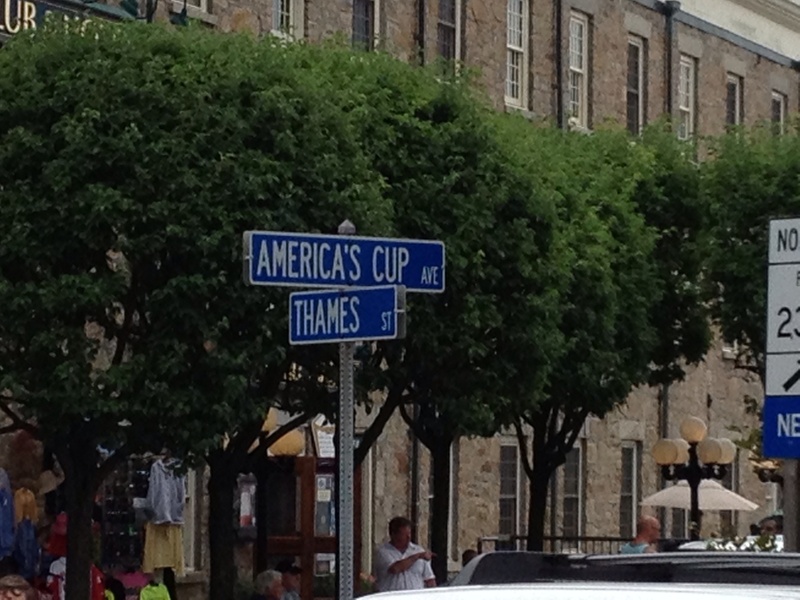 . . but as far as which city is the sailing capital? 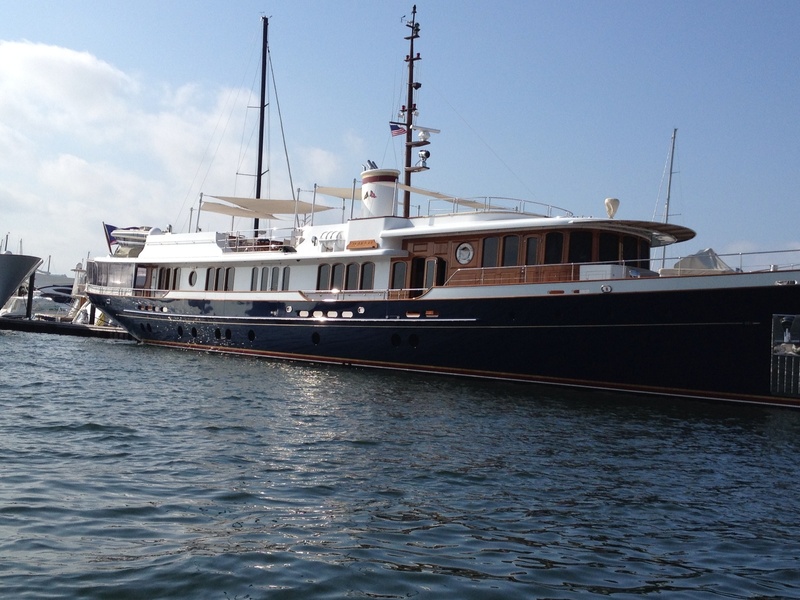 Newport is Annapolis on steroids. Don’t hate me, Annapolis. We had changed our minds about our next stop several times due to conditions. We wanted to end up at Fishers Island, but severe storms were coming through the area. We kept a close check on the radar map as we traveled and opted to stop in Point Judith, RI instead. We beat the storms there and got ourselves anchored and settled. A little while later, who comes on the radio but our new friends from Kabria! 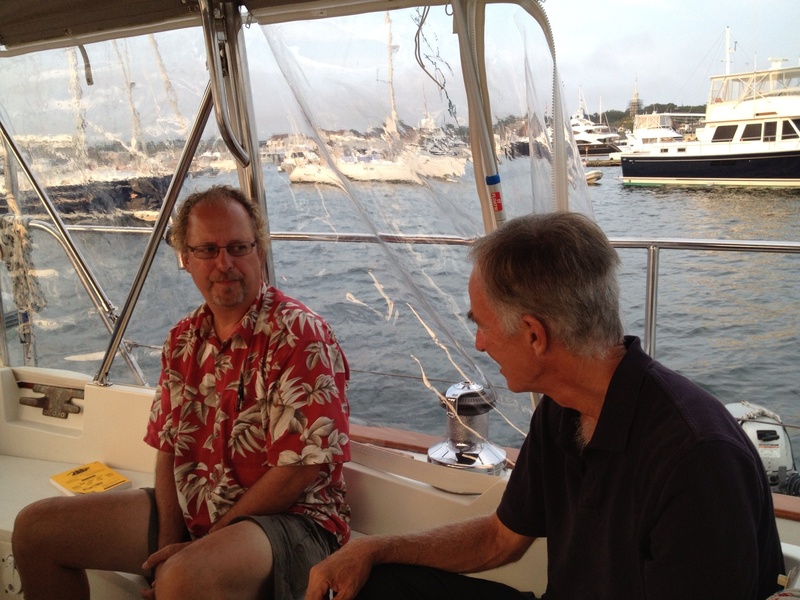 They were on their way to Block Island when they diverted due to the same storm system . . . and ended up in Port Judith right next to us! It was nice for each of us to know we had a watchful neighbor in place before the system came through. Although it wasn’t quite as bad as predicted, the storm still packed a bit of a punch and left behind about 4 inches of rain that evening. At one point the lightning was getting pretty intense and the winds were picking up when Frank donned the dreaded yellow foul weather gear. The yellow stuff (as I mentioned in a previous post) means things have the potential to get ugly. 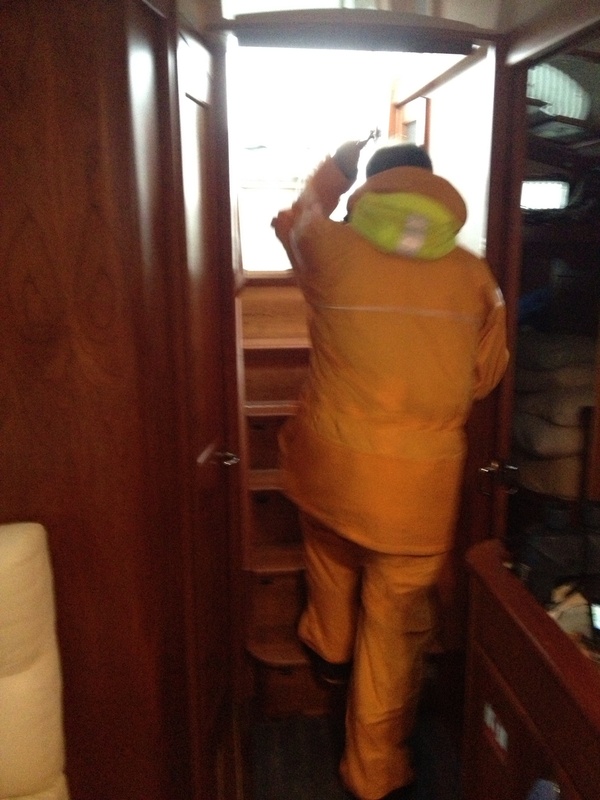 Frank in his foul weather gear. And then we had the calm AFTER the storm . . . an eventful day was over, we were safe, and all was well. Sunset after the storm. All’s well that ends well.